…or where was Susannah living in 1776? The answer to this question is by no means immediately clear. Susannah noted no addresses and she only occasionally refers to places. However, after a deal of pondering and detective work, I have deduced that her little entry on Tuesday 23rd January may tell us what we need to know. In early January 1776 Susannah was at Bookham Grove, Great Bookham, in Surrey. In London, her extended family owned at least two houses in Spital Square which they visit and, from late January to July 1776, the family appear to have lived in Wanstead, north-east London, perhaps renting a house, very near their cousins, the Lamottes. Although the family were still intimately connected to other Huguenot families – the evidence being the number of French names mentioned in the diary – and were still connected to Huguenot establishments in London such as the French Hospital, the Dalbiacs had presumably long lost the desire to go back to France. In 1745, Charles’s father offered 80 men to fight for the Crown in defence against the Young Pretender – the largest number noted as offered by individuals from the weaving fraternity – proof of the Dalbiac’s wish to be part of the English establishment (against Roman Catholic France) and also proof of their wealth. By the 1760s, Charles Dalbiac’s accumulated wealth would have enabled him to move out of the centre of London, taking advantage of road improvements in the mid-late 18th century, not for a daily commute from Surrey, but certainly able to make the 3-4 hour journey to London and back every 3 days or so. In 1764, when Susannah would have been 2, her father, Charles, bought a property at Durdans, just outside Epsom in Surrey. Durdans was originally a large house said to be on a par with Nonsuch Palace. Having had a number of aristocratic owners, a Mr Belchier bought the property in 1747, demolished the house as he thought it was ‘melancholy’ and built a new mansion in its place. But his luck ran out when it burned down just before completion of the building in 1755. Mr Belchier, perhaps cast down by his ill-luck at Durdans, abandoned the site and built another house nearby and a few years later, in 1764, he sold the Durdans property to Charles Dalbiac. Charles employed a young London architect, William Newton (clerk of works and architect at the Chapel Royal, Greenwich), to design a new house in the modern style. This house was then apparently sold by 1777 – a year after the diary. It is therefore possible that Susannah and her sister spent some of their childhood living at Durdans. GREAT BOOKHAM: However, Susannah specifically refers to Bookham, another village nearby in Surrey, and it transpires that a Mr Dalbiac also bought Bookham Grove in Great Bookham, Surrey. See reference to Mr Dalbiac, last line bottom left, from “A New and Accurate Description of all the Direct and the Principal Cross Roads in Great Britain 1776“. This house is also noted as having been sold by Mr Dalbiac in 1775. Charles’s property purchases and his building of smart new houses show an enthusiasm to move into the world of the English country gentry, but also, subsequent to riots in Spitalfields around this time – the result of a slump in the weaving industry – the area around Spitalfields may have seemed unsuitable for bringing up a young family. I also wonder if Durdans was the house he lived in with his first wife, Susanne, and their two little girls, Lucy and Susannah, and then after she died and he married again, he and Anne, his new wife, may have wanted to start a new household, which is why they moved to Bookham Grove. If Bookham Grove was sold in 1775, it seems quite possible that they actually moved out in early 1776. Susannah gives just a few clues to the possibility that they are leaving the house and the area. For example, in the first week of January she refers to the man coming to “take down the organ” and then, two days later, that “the man finished packing up the organ”. Initially I was rather puzzled by this but it transpires that chamber organs were popular in the 18th century (often going into use in churches in the 19th century) and I imagine this was therefore a domestic instrument being carefully dismantled and packed up to be moved to another house. A little later on, on Thursday 5th February, Susannah wrote, “The piano came down”. Perhaps this refers to the same instrument arriving at their new home! Two examples of chamber organs from the late 18th century. In the weeks before they move there were visits to be made: on 10th January, her stepmother paid a morning visit to Mrs Sumner at Hatchlands Park, and on Saturday 20th January, Susannah wrote, “Papa took a ride in the morning to Admiral Geary’s”. Mrs Sumner lived at Hatchlands and Admiral Geary lived at Polesden Lacey – both now National Trust houses – so Susannah’s parents were clearly on easy visiting terms with their grand neighbours. But the reference I like the most is to Mr and Mrs Cooke. On Monday 15th January “Mr Cook call’d in the morning”, then on Monday 22nd January, the day before they leave there is a further clue to them moving away as Susannah wrote “Mama went to take leave of Mrs Cook” (Susannah’s spelling is not always reliable and she often spells names according to how she feels on the day). Bookham was a very small place and given that Susannah mentions going to church – or reading and studying a Bible passage if they fail to get there – every Sunday, it is highly likely that they would have been on close terms with the local vicar. If this is the same Mr and Mrs Cooke, in 1776 they would have been in their early 30s, the same age as Anne, Susannah’s stepmother. As Anne was pregnant, at this potentially stressful moment in her life (being a stepmother, looking after a toddler, expecting another baby, moving house) she would have surely enjoyed the friendship of a woman said to be so “infinitely kind”. And that is my rather brilliant connection to Jane Austen! 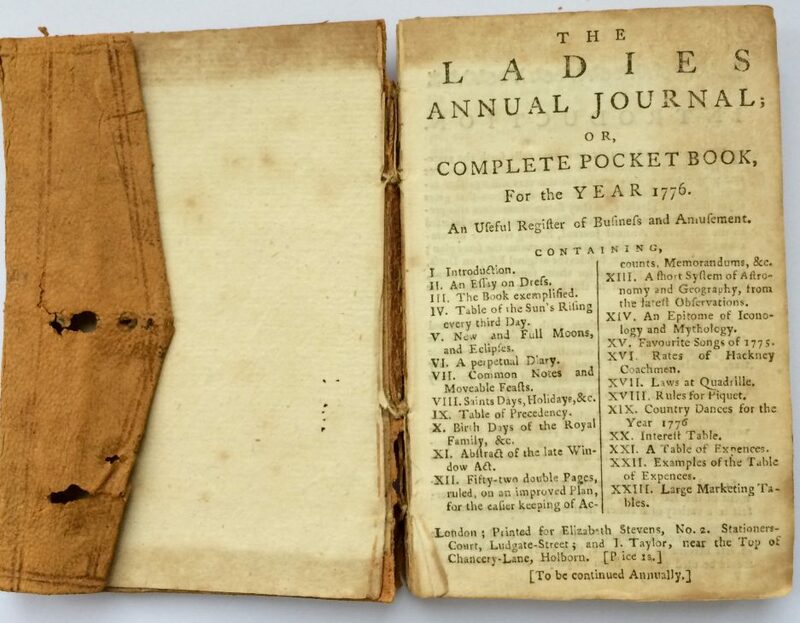 Susannah and her sister Lucy, and little half-sister Harriet, along with their father and step-mother, appear to live in Wanstead for the remainder of the diary that is written up to July 1776. Perhaps Charles and Anne thought it would be better for the expectant Anne to be nearer central London where Charles worked, and to be neighbours to so many cousins living in Wanstead who could help look after the girls. But if Susannah and Lucy had already lived in various houses and also lost their mother, apart from the benefit of constant loving attention from aunts and cousins, complete stability was illusive as in July they set off on a journey abroad.